Soviet perceptions of U.S. strategy remained remarkably consistent from the post-Stalin period through the collapse of communism in Eastern Europe and the Soviet Union itself. The consistency of the Soviet tendency to engage in the 'mirror-image' fallacy in their analyses of U.S. doctrine and strategic intentions has profound implications for the future relationship of the U.S. and the now-independent republics. This authoritative volume analyzes the Soviet/Russian perspectives of U.S. strategic evolution from the declaration of the 'massive retaliation' doctrine of 1954 through the Soviet collapse of 1991.The Soviets considered the growth of their strategic nuclear arsenal as the main factor giving them political leverage over U.S. foreign policy and predicted that a defense policy based on strategic defense would be the most effective deterrent from a Soviet perspective. Now the Russian military and political leadership places a high value on strategic nuclear forces in terms of political leverage and prestige.Building upon a wide variety of international sources, the Lockwoods offer a penetrating assessment of how the present Russian perspective will affect political relationships, not only with the U.S. and the West, but also among the independent republics. This factor will become ever more critical as they vie for decentralized versus unified control of what was the Soviet nuclear arsenal under the shadow of the collapsing economies. The authors also introduce a new theory concerning the future impact of ballistic missile defense on operational warfare in light of the U.S. experience in Operation Desert Storm. 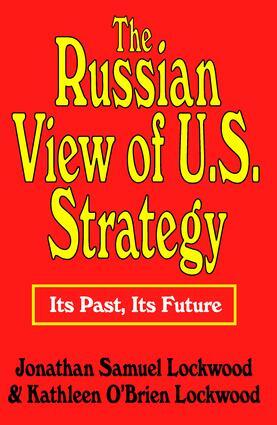 The Russian View of U.S. Strategy provides a comprehensive historical context and an up-to-date appraisal of an uncertain and potentially volatile development in U.S.-Russian relations. It will be of interest to historians, policymakers, and military analysts.